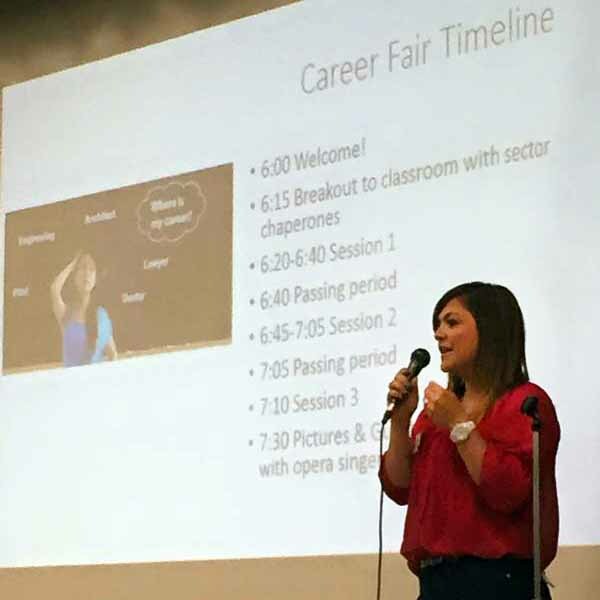 Click HERE for the 2016 Career Fair! THANK YOU so much for attending Moreland Middle School's First Annual Career Fair! a speaker, a sponsor or volunteer, you made the event a success! Because of you, over two hundred teenage futures have been positively influenced as their hopes for a substantial future have sharpened. Please read some of their journal responses which reflect their views about the evening. Whoever owns the Tesla made a huge impact! “I felt like all of the presenters really cared about us and our school!” ~Maral K.
“I saw many people who inspired me, but especially Erica. She made me think differently about how my career will be and it influenced my motivation to keep learning.” ~Sebastian G.
“Having this project changed my perspective on many things such as school, college, and my objectives. Even though I might change my mind in the future, for now, I have a plan that I’m sticking to.” ~Lauren L.
“There is only so much you can see online, but when our pediatrician guest speaker was talking, she said that progressively interacting with a child from when they are an infant to an adult is a ‘magical experience.’ She repeated the phrase, ‘magical experience’ to emphasize how rewarding being a pediatrician is. This showed me how rewarding being a pediatrician is and being a pediatrician is something I want to be.” ~Samantha D.
Thank you so much and see you in 2016! Erica Lockheimer of LinkedIn (above), who was recently voted one of the top 22 female engineers in the world by Business Insider, was a guest speaker and panelist, who spoke to the students about persevering and never giving up. Click on the picture above or here for more event pictures. global economy affect my career choice? Click here for our original video.